Like all astrophotography, photographing Saturn, other planets and night skies, requires an abundance of patience and perseverance. I well remember our first attempt at photographing Saturn. We finally managed to adjust our new telescopes’ focus correctly to catch our initial look at the planet and it’s rings. The focus was by no means perfect, yet we were gobsmacked with the absolute beauty we were seeing in the eye-piece. After what seemed like months of frustration, finally we could see our first planet. Now we could begin our astrophotography journey that we had long dreamed of achieving. Unless you have a good friend or mentor, the learning curve in astrophotography is huge. Astronomy forums such as Cloudy Nights, in particular the beginners forum, is an absolute godsend of information to aid the newby star gazer with all kinds of advice. The one thing piece of advice that was overlooked, was to loosen the knobs that hold the telescopes mirror securely during transit. Once we did that, focussing the telescope was relatively easy. Yet taking good astro photos of the night skies is entirely another thing. Clouds, wind, the moon, these are just a few of the impediments that you really have no control over when photographing night skies. One of the best tips we have received is to photograph Saturn in video mode, then process the video, frame by frame, using Backyard EOS software by O’Telescope. It’s pretty good software and gives quite good end photographs. The biggest drawback though is it’s a Windows only software, therefore us Mac users are made to get a windows machine or install a program so you can run Windows on the Mac. We went for a cheap Windows laptop and the software works well, but the machine is slow. Life wasn’t meant to be easy, especially if you are an astrophotographer. At least we can now capture images of all the planets, via video mode, and enjoy our efforts when the conditions are right. At this time of the year, we can photograph Jupiter early in the evening, then Saturn as it comes into the night sky and then later Mars. 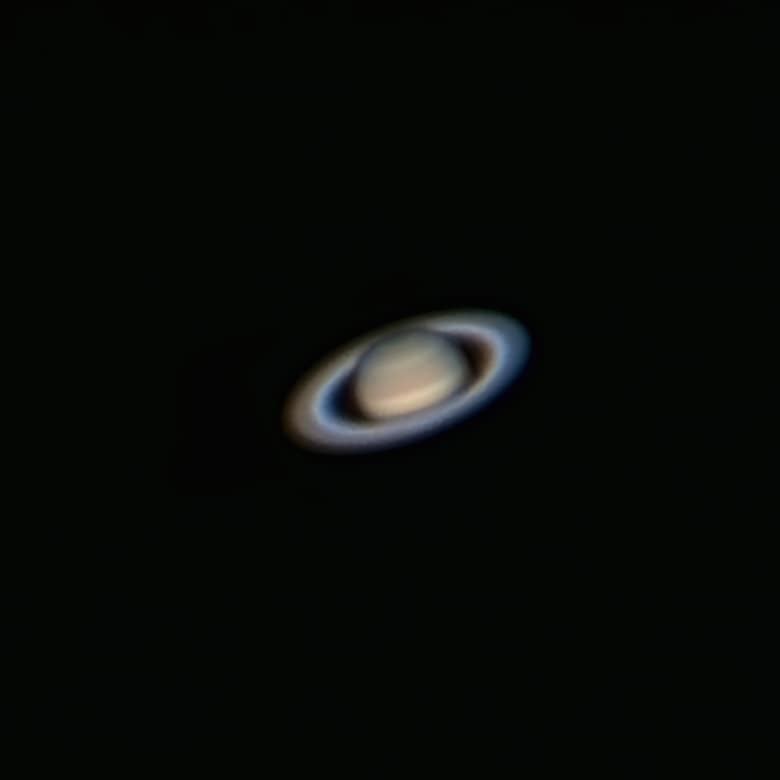 Saturn photographed with a Canon 5D MK III with Celestron 2X Barlow. This is connected to an 8″ Celestron Edge HD telescope. We are by no means happy with the image, yet understand that this astrophotography gig is a difficult road. It takes at least 2 years practice before acceptable results begin to flow. The positives for our efforts thus far is, the knowledge gained from these “not so good images” can only make us more effective down the track. Patience and perseverance make a good astrophotographer.